^ Enrico Fermi. Thermodynamics. Courier Corporation. 25 April 2012. ISBN 978-0-486-13485-7. ^ 2.0 2.1 2.2 2.3 Clement John Adkins. Equilibrium Thermodynamics. Cambridge University Press. 14 July 1983. ISBN 978-0-521-27456-2. ^ 3.0 3.1 Reichardt, C. Solvents and Solvent Effects in Organic Chemistry. Wiley-VCH. 2006: 9–10. ISBN 3-527-60567-3. ^ 成會明. 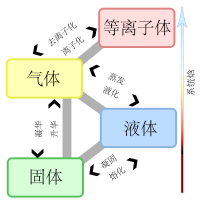 奈米碳管. 五南圖書出版股份有限公司. 2004: 14–. ISBN 978-957-11-3499-4. ^ 近代物理学进展. 清华大学出版社有限公司. 1997: 166–. ISBN 978-7-302-02521-4.